Selling is done by the salesforce either directly to customers, such as in case of industrial salesmen or to retailers, as in case of salesmen merely supplying shopkeepers and inducing them to stock the goods. 1) Prospecting, i.e. trying to find out likely customers who are called Prospects. 2) Pre-approach, i.e. trying to find out more about the customers, before actually meeting them. 3) The Approach, i.e. when the-salesman actually communicates with the prospect with a view to sell the product. 4) The actual selling where he Answers Objections and Closes the sale. 5) In addition to this, he may also provide services such as giving technical Assistance, arranging credit facilities and expediting deliveries. 6) Collecting Information useful for the organization. A salesman following these steps will have a higher chance of being successful with his customers. In sharp contrast to selling activity, a sales supervisor performs the function of managing the sales staff. This is a very important aspect. It is at times thought that good salesmen can make good sales managers. This is not true because a good salesman is very keen on selling or the `doing' part of his job. When he becomes a sales supervisor, and as he goes up higher and higher and becomes a sales manager, his job changes in emphasis to that of `managing', which consists of (1) planning and goal setting, (2) organising, (3) motivating, and (4) controlling his subordinates. Thus the job has changed from `doing' to "getting things done through people". Of course, it is true that many sales managers continue to perform the selling function and provide necessary support. Now let us try to understand the field of sales management. There is a lot of confusion in the expression Sales Manager and Marketing Manager. They are at time used synonymously. You have learnt the meaning of marketing and therefore know that the marketing manager is concerned with the four P's in marketing. The sales manager's function is limited. It is limited to one of the P's in marketing, namely, promotion. "The planning, direction and control of the personal selling activities of a business unit, including recruiting, selection, training, equipping, assigning routing, supervising, paying and motivating as these tasks apply to the salesforce." 1. Selection of the sales force. 2. Training the sales force. 3. Motivating the sales force. 4. Controlling the sales force. These are depicted in Figure I. These will now be dealt in details. The sales manager's job is basically to provide leadership to the salesforce. However, if he does not have the right persons, it will be difficult for him to get desired results. Therefore, the first step, or the first function of the sales manager, is to be concerned about recruiting and selecting the right type of salesmen. A good salesman creates a good image of the company, as the customer evaluates even the company from the way in which the salesman has behaved. It can thus be said that the salesman who is working under you, represents your face and that of your organisation. To the people he meets casually as well as your customers he handles, he is YOU and YOUR COMPANY. Therefore, how he conducts himself and how he speaks reflects on you and your company. In addition, proper selection would result in better employer-employee relations as the salesman would be happy in his job. There will be a smaller turnover, meaning that the salesmen will not leave out of disgust or inefficiency. The organisation will have a more effective salesforce, and will enjoy good customer relations. Adequate selection requires a proper step by step approach. You must first know the type of persons you want. Then it becomes necessary to find out from where you can get them. Then alone can arise the question of actually going about getting the man, testing him and making your final decision. 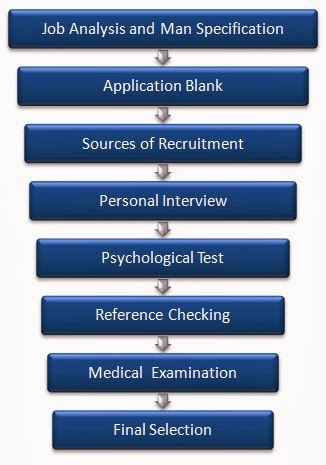 The steps in the selection procedure are given in Figure II. Let us now go through these steps. In actual practice, often organisations are not very clear as to the type of person they require. They just decide that we need `salesmen'. We have to be more specific. In order to do this, it is necessary to analyse the job for which the salesman is going to be selected. In good companies, there are job descriptions available which give details of the particular job. Even this is not enough, because we want to know the type of man who will be able to fill that job. This is described as man specification and gives the qualities required of the person who can do this job properly. 4. the personal characteristics required to handle the job. At times, technical qualities are required. If this is not required, one should not try and get a man with a technical background and pay unnecessarily more money. Besides, he may not prove to be a good salesman. Thus we must specify what are the general qualities required in addition to the technical ones, if any. Many researches have been conducted to find the general qualities which make a good salesman. Given below are some of the general qualities which are required of a good salesman. 1. Honesty and Reliability: The salesman must be one who can be trusted, as he has to handle even money, besides merchandise. He must be prompt and on the job everyday. He must be one who can be relied on not only by you but also by his customers and his fellow employees. 2. A Self-starter: A salesman is often on his own, particularly the travelling salesman. He must therefore be able to work without constant supervision. 3. Orderliness: He should have a neat and pleasing appearance and must be one who keeps things clean and in good working condition. 4. Friendliness: Perhaps friendliness is one of the most important qualities. He must be sociable and must get along well with people, as otherwise he will not be able to sell at all. 5. Self-control: He should be able to handle difficult people and not lose his temper or become upset. 6. Good Handwriting: He should be able to write legibly, as salesmen often have to write orders and complete report forms. The above are a few qualities. In addition, many more are given by different people like courtesy, industriousness, initiative, judgement, persuasiveness, resourcefulness and so on. We now come to the preparation of an Application Blank listing questions required to be answered by the applicant. From the man specification, we have realised the qualities we are looking for in the salesman. Appropriate questions have to be now drafted so that the answer to these questions will indicate the suitability of the applicant who will thereafter be considered. 1) Internal, i.e. from inside your own staff as well as through recommendations from existing salesmen or customers. 2) External, like (a) advertisements, (b) employment exchanges, (c) educational institutions, (d) from competitor's staff and (e) placement services. Advertisement is the commonest source from which recruits are obtained. However, the advertisement should be sufficiently detailed so that you are not deluged with a large number of undesirable or inappropriate applicants. It is common knowledge in India that, even when the advertisement states specifically that "Chartered Accountants need only apply", in practice even B. Corm's apply because they feel that they know accountancy. Therefore, if such a qualification was not mentioned, you can well imagine how many more unsuitable applications would have been received. Now that we have got a number of applications, we must go through them and weed out those which are obviously undesirable or inappropriate for our requirements. Then comes the important step with which you, as a manager, would very likely be concerned, namely, the personal interview when you come face to face with the applicant and have to determine his suitability for the job. You may indulge in one or a number of interviews as you may deem appropriate. The greatest advantage of the interview is that you can now see what he looks like and check if he has any undesirable expressions. We have mentioned that certain qualities are required. By asking appropriate questions, you can judge whether he has those qualities from his answers during the interview. Some organisations indulge in psychological and personality tests. It should be mentioned here that it is difficult to devise proper psychological test that can predict a good salesman with high degree of accuracy. Hence it is not given great importance. Now that we have almost arrived at a final decision, we must check the references given by him regarding his character, educational background and previous experience. This is an important step and should not be neglected. The medical or physical examination is not always necessary and should not be indulged in unless it is needed for certain qualities essential for the job. For example, if we want a salesman who can distinguish colours, a medical test showing whether he is colour blind or not would certainly be appropriate. Similarly, if he has to travel consistently, his health condition becomes relevant. Now the time have arrived when the final decision has to be made about his suitability. Everything done so far has to be reviewed. We must find out whether he is a willing worker. He should not be a "rolling stone", which can be found out immediately if he has had many previous jobs. Even when he has previous jobs, the trend of the jobs-progressive or not will show you his desirability for recruitment. Thus a final decision has to be taken now. Now that we have made the selection, we must provide for adequate training so that the applicant really becomes suitable for the job. Gone are the days when people thought that "salesmen were born and not made". Research has clearly indicated that the person can be trained to become a good salesman. 1. He makes a more enthusiastic presentation. 2. He has the ability to clinch the order. 3. He has greater product knowledge. 4. He pays closer attention to ensure that services are rendered to the customers. 5. He has superior territory organisation. 6. He answers objections better. 7. He can obtain more customer interviews. 1. Knowledge of the company, its background and history. This will give him a perspective as to how he fits into the organization structure of the company. 2. Knowledge of the Company's products and more particularly the `selling points' or advantages that he can emphasize with a view to close the sale. 3. Knowledge of customers, i.e. details about the types of customers and how they should be handled. 4. Knowledge of sales and other procedure which is prescribed, such as how to get orders, what forms to fill up, the sales reports required, etc. 5. Training in the art of selling or salesmanship. 6. The last point is extremely important. Salesmanship is desirable for everybody because it is the art of persuasion. Salesmanship has already been mentioned. 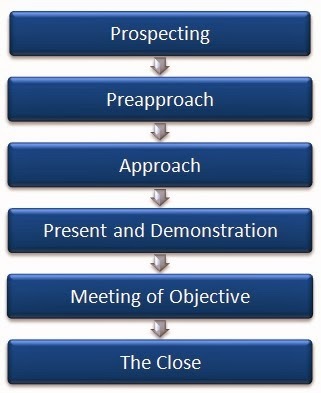 However Figure III gives the selling or sales process. Now that we discussed the benefits and goals of training, we should consider the three basic types of training which have to be given. In the beginning, a break-in training is given, which gives him the basic knowledge or material as already indicated. However, this is not sufficient in practice. The Salesman must thereafter be given coaching actually in the field and put in charge of a senior salesman who is also a good trainer. In addition, from time to time stimulation or motivational training is given at Sales Conferences and other places, so that the salesman is all the time motivated. We have decided what knowledge or information has to be given and where it is to be given. It now becomes necessary to determine how this has to be done. This is what is meant by training methods. The Telling Method is the oldest form of communicating information and is often described as lectures. These can be quite boring and the salesman may feel that he is not a student in a classroom. However, this is a method which is extremely good in communicating information quickly. The other methods take a little time, although they may be more effective in terms of results. In the Showing Method, the trainer actually shows or demonstrates the technique. This is the actual `doing'-more or less like `role playing' and is a very effective method. He may take the salesman to a customer and actually sell. The salesman watches him carefully and thereafter there is a discussion on what happened and how he would have behaved in the particular situation. The aspect of motivating consists of getting the best effort from the salesman while he is performing his job. If he is a good salesman and likes to sell, he will automatically be motivated. Thus motivation is a function of the salesman himself and the organisation as well as the environment in which he is operating. In the early days, the punitive aspect fear was used to motivate people. Later-on, the economic factor came into existence and stress was laid on appropriate methods of remunerating the salesforce. Finally, apart from the `hope of reward' replacing the `fear of the sack', psychological incentives are also sought to be used. We will now deal with these two types of incentives separately. 2) Straight commission on sales. 3) Salary and commission on sales. 4) Salary plus commission on sales above a certain amount. 5) Salary plus commission on varying totals or different types of goods. 6) Salary plus a share in the profits. It will thus be noticed that there are many methods of remunerating salesmen. In case of a straight salary, the salesman is paid the amount irrespective of his performance. Thus the remuneration is not geared to his productivity. However, some organisations are of the view that if you select and train a salesman properly and provide adequate salary, it will motivate him as he knows that he can get increments as motivational factors. As against this, the opposite view is that a straight salary makes the salesmen complacent. If he is given commission on sales, there is a direct link of the remuneration with his sales performance. It is true that the commission method is more motivating. However, it can be undesirable, where through no fault of his own, the salesman cannot earn enough commission to support himself and his family. Therefore, the third method is the most popular one where a basic salary is given to provide him with the basic necessities of life. If the salesman wants to enjoy life, he must earn his commission. This provides the maximum motivation from the compensation structure. Thus motivation should be built into the system itself. It should however be remembered that the compensation plan should be appropriate. It should be ‘simple' and not complicated, so that the salesman understands and appreciates it. It should be `personal' so that it would motivate the particular salesman. The plan should be `moderate' and within the reach of the salesman. If he finds that he cannot earn the commission, he will stop trying to increase his sales. The compensation should provide a 'continuous incentive'. Apart from remuneration as an incentive, there are other methods of motivating salesmen. There are certain `needs' requiring satisfaction in the human being. These are not merely physiological. There is a need to belong or be loved. This can be provided in the work situation by the supervisor under whom the salesman works. There is the question of esteem. A pat on the back at the right tithe can go a long way to motivate the salesman. Finally, there is self-actualisation, i.e. a person wants to do better and get promoted further. Thus there are certain needs which can be satisfied through an adequate incentive plan of a non-financial nature. These are called psychic wages. 1) Make the salesman like you, be fond of you and want to work for you as the supervisor. 2) Praise him when praise is due: A good rule of human relations is "to praise in public and scold in private". However, idle flattery will soon be found out by the intelligent salesman. 3) Respect his personal ego: He should not be belittled. As already indicated, do not criticise him in the presence of others. 4) Allow him to participate, i.e. to discuss with you and help you in the shaping of decisions, particularly those which affect him. For example, when setting the sales target, the salesman can be consulted before a quota is fixed for that particular salesman. This is what is meant by `participation'- the modem leadership technique. 5) Set a good example: This is perhaps the most important. The subordinate generally watches his superior and often tries to `copy' him. 6) Give him emotional security, by showing him that he is working for a good company, a good boss and a good product. 7) Finally, show him how he would benefit and not how the company benefits from his performance. Thus, for effective motivation, you must inform him as to what is expected from him. Tell him what the company gives him, use the carrot technique to get his cooperation and above all set a good example. 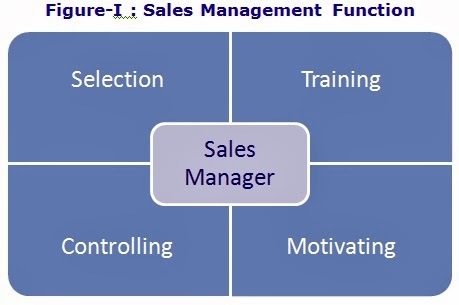 Now we come to the final aspect of the Sales Management function, namely that of controlling. Management consists of (1) Planning, (2) Organising, (3) Motivating, and (4) Controlling. Goals and objectives are provided in the planning stage and the controlling stage is used to `evaluate' how well those objectives have been reached. It is necessary to have some form of control over the salesforce. It is true that if salesmen are selected properly and trained appropriately very little control will be required. However, some form of evaluation is considered necessary in management. The best method of control is naturally Personal Contact. This is however not possible from, let us say, the sales manager's level right down to the salesman's level. A supervisor has personal contact over the salesman directly under him. However, as an organisation grows, some other form of control has to be adopted. Correspondence is one method where the distance can be obviated. However, the most popular method of controlling salesmen is through Salesmen's Reports. Let us discuss a little more in depth the question of evaluating the salesman's performance from the salesmen's reports. The Report is generally drafted well and often in a printed form, which the salesman can complete quickly. 1) The Report should be brief. 2) As far as possible a printed form should be used where a check mark (./) would answer most of the questions and very little of writing is required. 3) Information should be so arranged that it. can be summarised and used at the home office. Please remember that you should not ask questions where the answers are not going to be used by the organisation. 4) Carbon copy must be provided for the salesman. 2) Report of Daily Calls, covering the entire day and giving details for each call separately. 3) Report on Prospective Customers, to indicate how much missionary work is being done. 4) Report on Customer's Complaints. 6) Reports on Working Plans. 7) Report of Customer's Inventories. You can thus well imagine that there are a host of reports from which a selection can be made. Now supposing you have about a hundred salesmen to cover the whole of India, you naturally have to divide India into one hundred parts and allocate one part to each salesman.. We are sure you must have realised that you cannot just take the map of India and cut it into one hundred equal parts and allocate them to the salesmen. If you do this some of your salesmen may get mountains or desert, where no prospects exist. 1) Prospect density, i.e. the number of likely customers in the area concerned. 2) Extent of ground to be covered. 3) Possible volume of sales. 4) Frequency of visits required. 5) Intensity of selling required, i.e. the time taken up by each interview. 6) Convenience of getting from one place to another including modes of transport provided or available. 7) The rate at which the shopkeeper buys and resells. 8) Whether the article is easy or difficult to sell. Considering all these factors and the number of salesmen available, it then becomes possible to allocate the territories intelligently. It should be remembered that salesmen are anxious to get as large a territory as possible. Experience has however indicated that a smaller territory is better, as the salesman takes less time in travelling from one prospect to another and provides greater depth of effort. It is better to have this intensive rather than the extensive cultivation of a territory.